At Epic’s recent UGM conference in Verona, WI, CEO Judy Faulkner painted a very big vision of the future – “One Virtual System Worldwide.” She was speaking to the Epic faithful on where Epic and its customers would travel next, a place in the cosmos leading to dramatic breakthroughs in clinical science by phenotyping the de-identified EHR data of all Epic clients. A foundational element to that virtual system is a new platform, Cosmos. 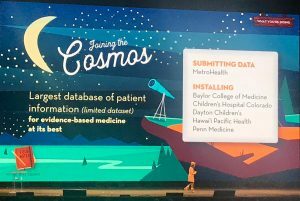 Cosmos is a hosted data warehouse built on Caboodle stack and will include a hosted version of Epic’s analytics toolset, Slicer-Dicer that researchers can use to explore the data. That would be incredibly cool as today there are about 200 million patients with health data in an Epic EHR. But there may be a tear in the Cosmos. While this is a new release, today Epic has only convinced a small handful of customers to participate. Healthcare providers, particularly large academic medical centers, may be wary of submitting their data for others to use, even for research. Just how open that virtual system Judy speaks of is to other, competing healthcare solutions is unclear. To Epic’s credit, over the last few years, they have opened up to a significant degree – at least relative to their past walled garden approach to the market. Today, over 100 third-party apps are now available within their App Orchard and a couple of hundred more are in the wings (for more on exactly what App Orchard can and cannot do, Chilmark recently profiled it in our report on health care app stores). The company is also aggressively looking to create a store for new ML/AI models. Today, over 200 clients have developed some 500+ models that work within Epic and that number grows daily. 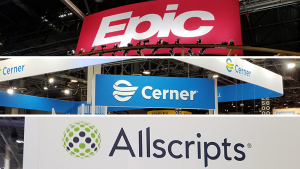 The company has also made pretty strong headway on the interoperability front, exchanging some 3.5 million records daily – over a third from non-Epic EHRs. 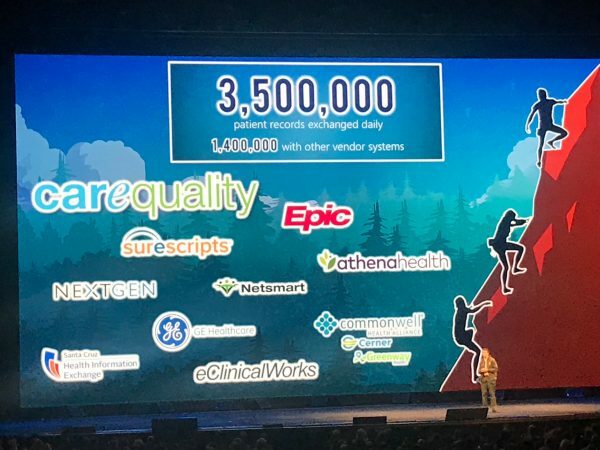 Saw numerous examples in presentations by Epic clients of their use of CareEverywhere to enable care coordination across a heterogeneous EHR network, commonly found among today’s Accountable Care Organizations (ACOs). Epic C.O.O., Carl Dvorak’s keynote was far more pragmatic focusing on how organizations can derive greater ROI from their Epic EHR through benchmarking. Claiming to have over 700 benchmarks developed to date to measure anything from clinical workflows to an analyst’s use of Epic’s analytics tools, Carl provided some good examples of how an organization can improve workforce performance. With ever tightening margins for most healthcare organizations, this message was well-received. One of the more curious aspects of UGM this year was the near total lack of discussion on the migration to value-based care. Listening to the Epic presentations, visiting the booths of their various modules, looking over the program guide, one was struck by the sheer dearth of attention to this increasing challenge for provider organizations. A provider CEO did confide to me that during the concurrent CEO forum, this topic was discussed at length. But one has to wonder why Epic chose to seemingly ignore this issue, especially for the rank and file users of Epic. And despite Epic’s growing openness, it did not sit well with me some of the comments Epic executives made regarding patient access to their data via APIs from third-party apps e.g., Apple’s Health app. Epic’s position is that patients don’t necessarily understand the full ramifications of their data being used by others, via various apps, which may end up in nefarious hands. Epic – let me make that call. Who has access to my health data is my decision, not yours. Your stance harkens back to old, paternalistic modalities in healthcare that are thankfully fading. That alone is testament enough as to the continuing success of Epic. Will that sense of mission to do the right thing to improve clients’ success and in turn improve healthcare delivery extend beyond Judy’s tenure? Only time will tell, but I sure hope so.